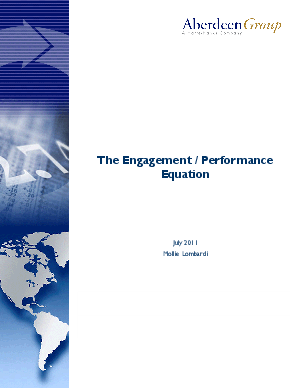 Employee engagement and performance management go hand in hand. The goal is to align needs, desires, skills, and activities of employees with what the business requires to achieve results. This study of 438 organizations examines strategies, tools, and processes designed to improve engagement and performance. Best-in-class organizations achieved a larger percentage of performance reviews that exceed expectations, higher engagement, and improved employee retention. They established a culture of alignment, used tools to increase goal visibility and transparency, and created full accountability between individuals and managers for business results.